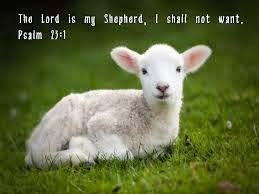 "The Lord is my SHEPHERD..." The Lord Jesus is my ruler, my guide, my friend. He is my herdsman that keeps me company when I'm alone - He is my Pastor. "...I shall not want." As my ruler, my guide and my friend, the Lord will provide ALL that I need and I will not want for no thing! "He makes me to lie down in green pastures; He leads me beside the still waters." The Lord gives me rest when I need it. He leads me to where I need to be and leaves me to rest in the comfort of His presence where I am safe. "He restores my soul" The Lord refreshes me when I can't do it myself. When hope is lost He is there with me, giving me strength. "He leads me in the paths of righteousness For His name’s sake." I can not lean on my own understanding, but instead must learn to trust in the Lord. If I acknowledge Him in everything I do HE will lead me in righteousness on the path that He chose for me before time began! No matter what I face, even death, I will fear nothing for the Lord Jesus, the creator of the universe, and ALL contained in it is with me! The most powerful force that exists has got my back - whom shall I fear? No weapon formed against me shall prosper because He is there to crush it with His rod (club; word; power). His staff rescues me when I'm in trouble! "You prepare a table before me in the presence of my enemies;"
Even when surrounded by enemies, the Lord sets before me a feast, a banquet of safety in His word, His blood, His purpose for me. He is my shield and my strength! "You anoint my head with oil; My cup runs over." The Lord has anointed me to do His work, according to His will and plan, not mine. He has bestowed on me an exceeding abundance of blessings - so much so that I bubble over with His love! I am surrounded by angels, protecting me at all times. Their names are determined by their function - SURELY will always be there when I call; GOODNESS will invade my heart and cause me to act righteously, even when I am too weak to do it myself; MERCY enables me to to show the love and compassion of Christ to all I encounter. These protectors will be with me always! And at the end of the race, when I lay my head down for the last time on this earth, when I breath my last breath, I will instantly be transported into the presence of God and there I will live through all eternity!